It had been a rainy week here in Missouri, but with a Saturday without any previous obligations, I knew that I had to pack up the dog and head out for some trail time. I didn’t want to have to go too far, but I wanted to hike somewhere new. It would be a great opportunity to experience the liveliness of a forest full of trickling water, but it would also probably be a hike through a lot of mud. I had a trail in mind, and the one thing I knew for sure was that any time I had heard mention of this place, no one ever had a negative thing to say. 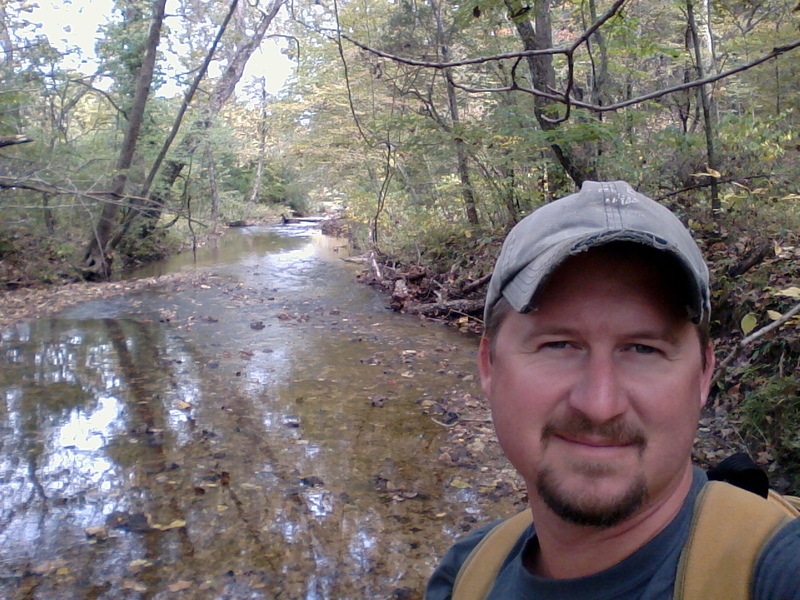 So after a nice breakfast and some coffee, we filled up our water bottles, checked the supplies in the day hiking backpack, and headed out to the LaBarque Creek Conservation Area, southwest of Eureka, MO. From the interchange of Interstate 44 and 270, take 44 west for about 12 miles to Highway 109 in Eureka. Make a left and take 109 south for about 2 miles to Route FF. Make a right on FF, and stay on that for almost 5 miles. You will come to Route F (only one F), and you want to make a left turn followed by an almost immediate right turn onto Doc Sargent Road. 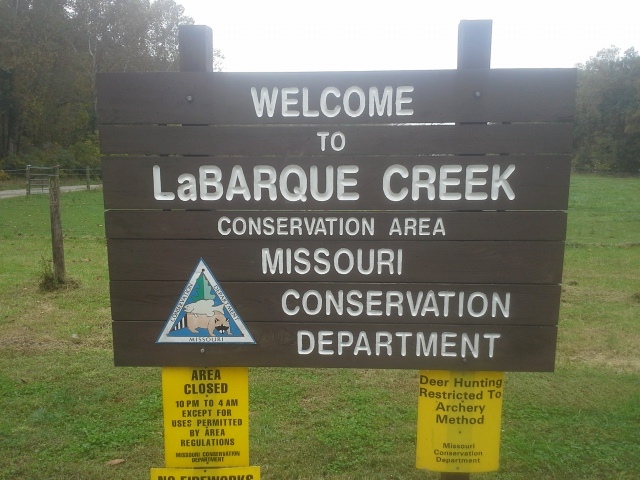 Stay on Doc Sargent for nearly a mile, until you reach Valley Dr. Make a left on Valley Dr., and the parking lot for the LaBarque Creek Conservation Area will be just up ahead. The trailhead is across Valley Dr. from the parking lot, and it starts with crossing a bridge over LaBarque Creek. 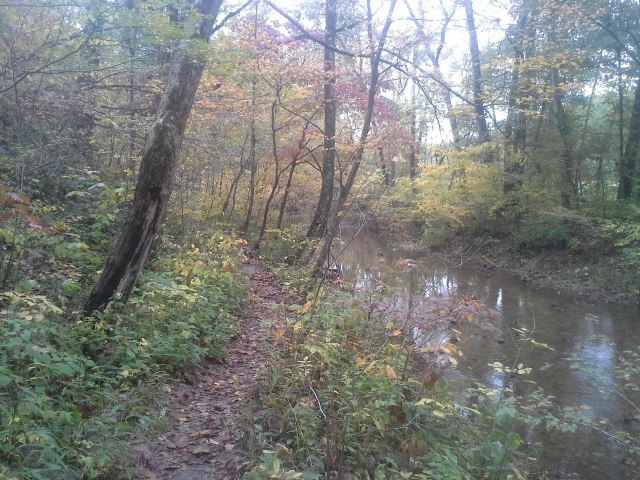 It then turns to the right and follows the creek for just a bit until it heads up the hill to the left and into the woods to a fork in the trail. 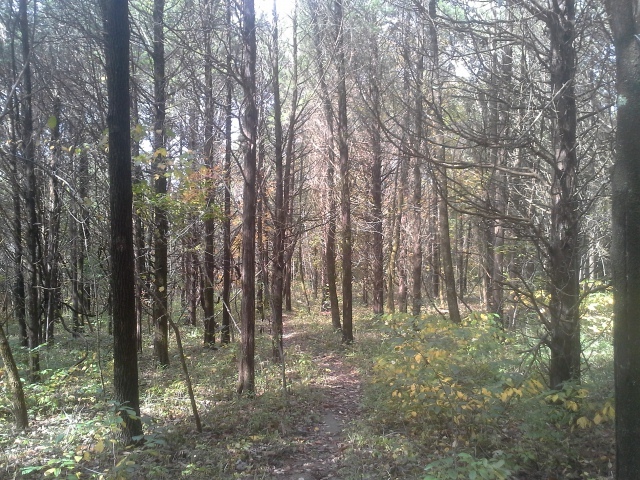 It is a 3 mile loop trail, and we took the fork to the left. It meanders up and into the forest of the LaBarque Creek Natural Area, following the curve of the hills as you slowly climb toward the highest point, about halfway along the trail. It then heads steadily down back toward the creek, following a little tributary down in a ravine, crossing a glade with a pleasant little wet weather trickle over exposed rock, and eventually back to the edge of LaBarque Creek itself. Then it is back through the woods to the fork, out to the creek again, and along it to cross the bridge to the parking lot. It has a “Big Woods” feel to it. What I mean by that is, as you head back into the forest, even though maybe you can hear the far off sound of cars on Route F as you ascend the hills, there is a solid sense of wilderness isolation and time spent growing in the trees that surround you. From elderly Cedars to the canopy of Walnuts and Oaks, this feels like a forest that has spent a good amount of years being allowed to flourish and grow. Sure, there are signs of recent conservation management activity, but when you get back in there, it really has an ancient energy to it. The trail itself was in great condition. A good packed surface that wasn’t too muddy or slick after all the rain we have had, and just a handful of fallen trees along the entire 3 miles. When we have had wet weather, it can turn a hike on your favorite path into a torture session. This one turned out to be a pretty good choice overall. We got lucky that it had rained over the past few days. There were noticeable trickles moving downward along the sharpness of the ravines. 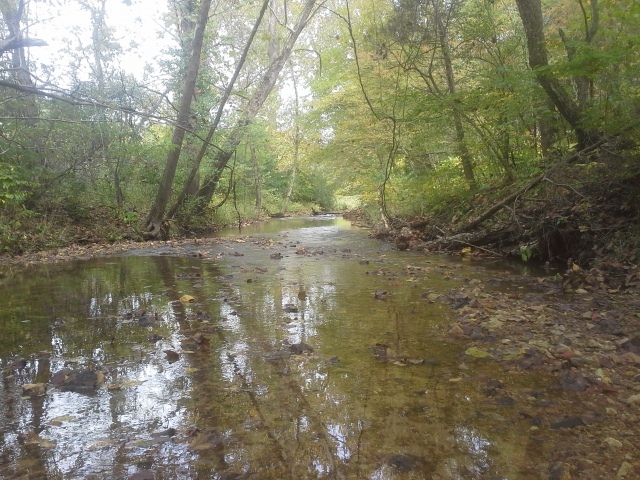 A very lively experience, hearing the splashing and dripping of saturated hills sending their collected rainwater down to LaBarque Creek, to eventually join the Meramec River before adding to the immensity of the Mississippi, miles away. 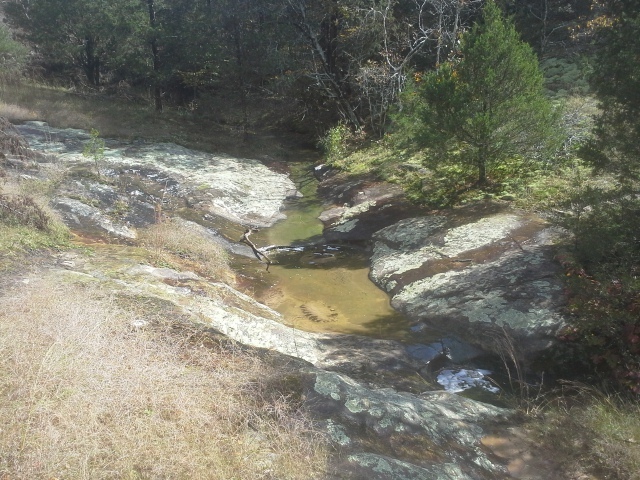 Flowing water in the woods always adds a positive aspect to any hike, as far as I am concerned. This is a rugged trail. 3 miles of climbing and descending, with exposed rock that can be slick and uneven, to muddy patches hidden by the drooping trail-side grasses. Be prepared for a good hike, and bring along enough water and watch your step. 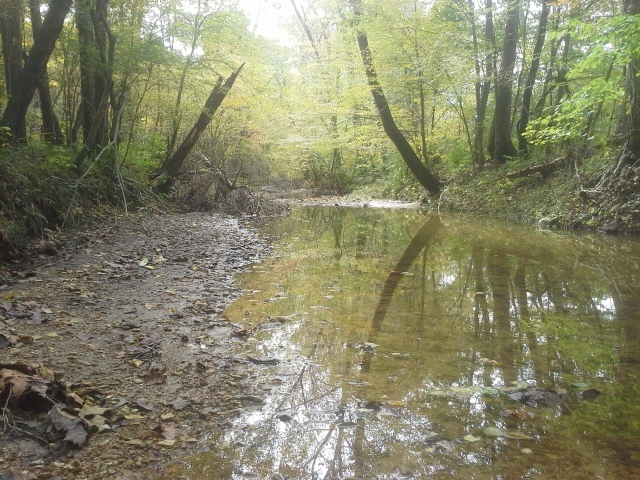 This is a conservation area that is surrounded by private property. Be aware that hunters may be waiting silently in the forest for dinner that evening, and the property line of somebody’s yard may be just over the rise of your left. Be mindful that other people may be nearby, and they are enjoying the forest the same as you are, but from different viewpoints. And in the interest of safety, keep your dog under control and don’t allow it to run off into the woods without you. There were sections along the trail where a lot of work had been done to cut down the growth of some invasive trees. 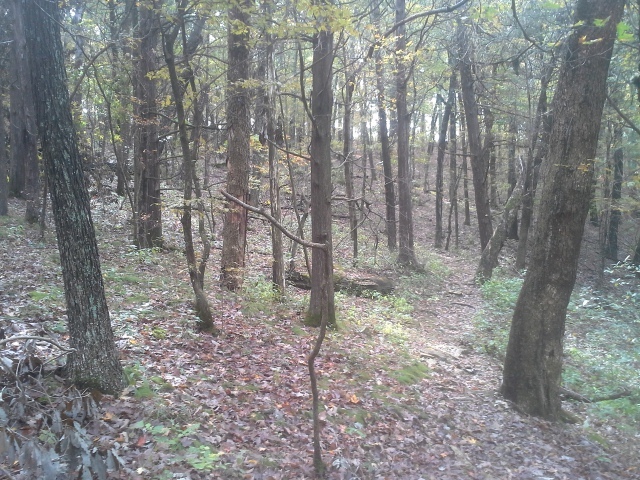 For those of us that are sensitive to the influence of man over nature, people who are concerned for the plight of our natural places, be assured that the graveyards of Eastern Red Cedars created by the Missouri Department of Conservation is a good thing, and it is work that is done to assure a rich biodiversity in these woods, thereby making it a healthier environment. I had never been to this place before, though I have explored farther down LaBarque Creek in the Young Conservation Area. It turned out to be a special area, from the steep gullies and upper hardwood forests, through the glades and into the lower hills along the creek. Truly a lot going on here, nature-wise, and I know that it will be a place I will return to soon. A trail that has been added to the list of natural places that pull me to them. Go see for yourself, and let your own experience there create a connection in you to the forest that stands back in the hills beyond LaBarque Creek. Looks beautiful! Added it to my list of places to check out! Thanks for the great post! I have hiked here many times. It has become one of my favorites. I love all the creek valleys and wet weather water falls. It is a great place! That whole LaBarque Creek watershed is a pretty neat area, with Young Conservation Area and Glassberg Conservation Area. All new places to me at least.